Throwback to 2007 (I’m the one in the middle). 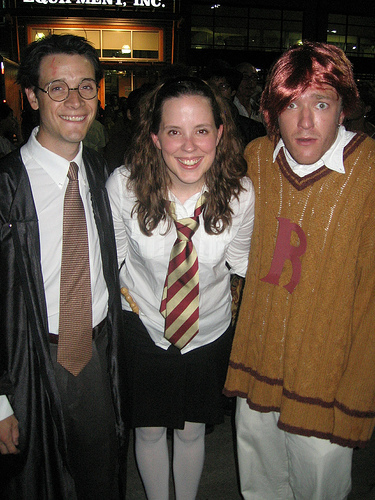 I first read Harry Potter as a senior in college, when a friend lent me the first three books out of the blue. I had no frame of reference for what the books were, but I was instantly hooked—just like everyone else. 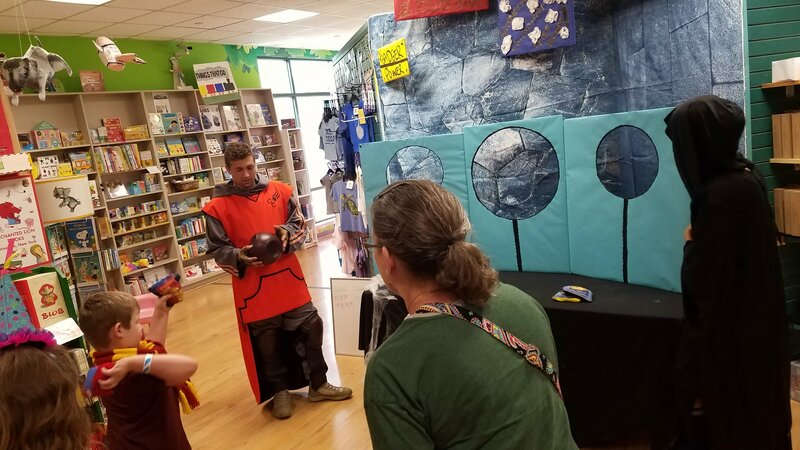 I came to BookPeople in fall of 2005, which meant I missed being a part of the release of Harry Potter and the Half Blood Prince, but I was certainly there for the 5,000 person blow-out in our parking lot for Harry Potter and the Deathly Hallows. It was the most extravagant event I have ever been a part of, with character red carpets, a Diagon Alley set, a fire dancer, and the Austin Symphony Orchestra. 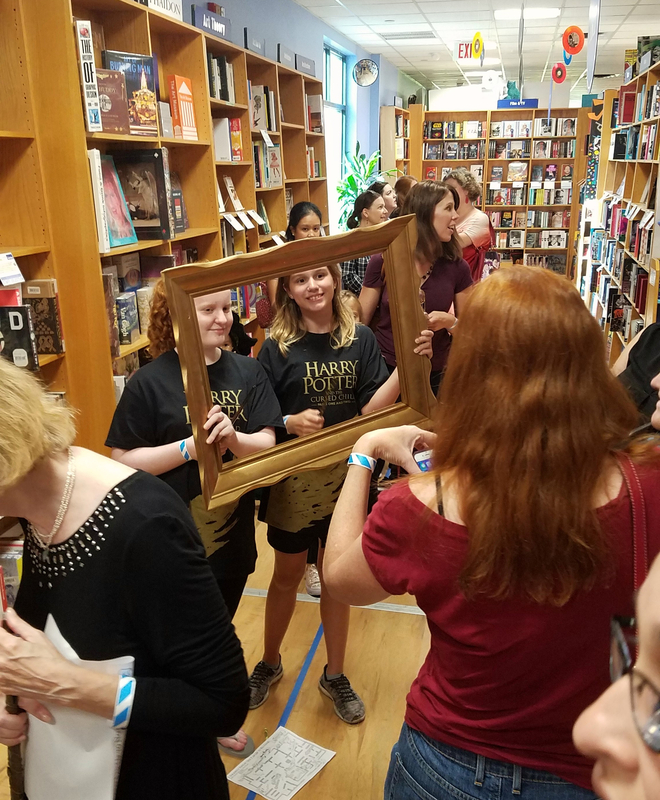 Just like many of you all, we resurrected the midnight release party for the launch of Harry Potter and the Cursed Child in 2016, and I was once again blown away by the turnout. I wasn’t entirely sure what to expect, to be honest, since it was a play script rather than a novel and didn’t list J.K. Rowling as the sole author. But we saw more than 3,000 people of all ages turn up once again to relive the magic. I would say the one change was that the audience seemed slightly older overall, but it was no less exuberant. This year, we joined in the fun once again to celebrate the release of the newly repackaged 20th anniversary editions with art by Brian Selznick. With no new text to promote, we decided to move the party inside, spreading activities throughout the store. It shouldn’t surprise anyone that demand once again outstripped our expectations. We actually had to cut off activity participation to keep it from getting completely out of control. 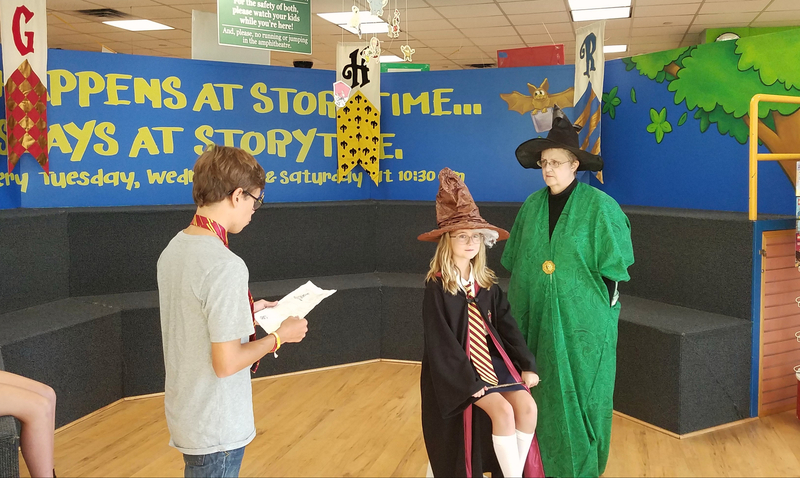 But even with more than 400 people rotating around our store to compete in trivia, take their turns at activities like Quidditch and wand dueling, put on a show for the costume contest, or grab a treat from Honeydukes, the energy was palpably joyous. People were just happy to be able to don their robes and enter that world for a little while. 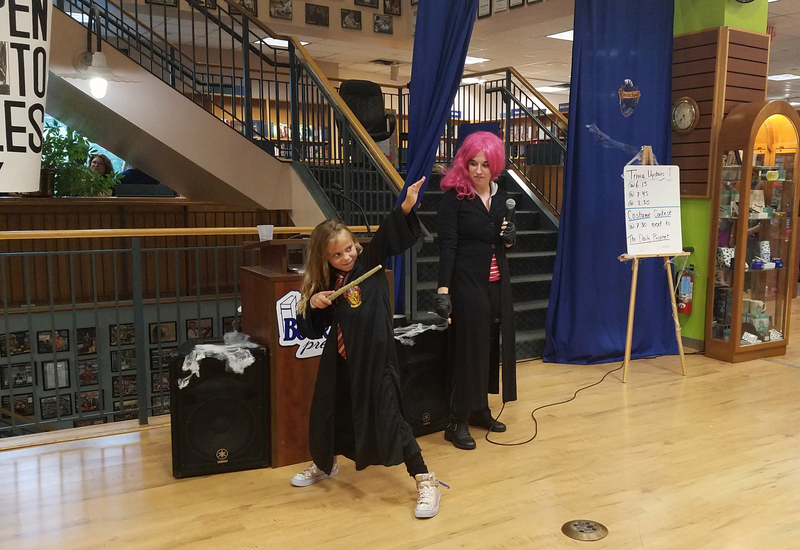 Our CEO, Elizabeth Jordan, remarked that she always forgets the special glow that comes only from these Harry Potter events until we do one again, and she’s right. Nothing else we do feels quite like this. 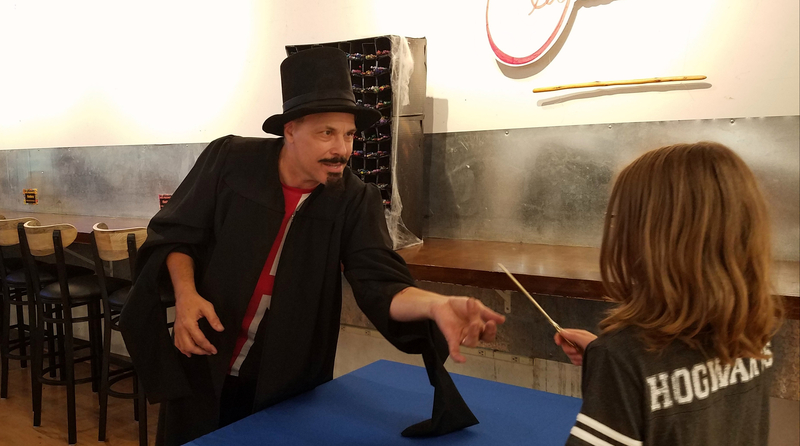 Of course it helps that one of our resident Potter superfans, Shannon Brewer, planned a heck of a party. 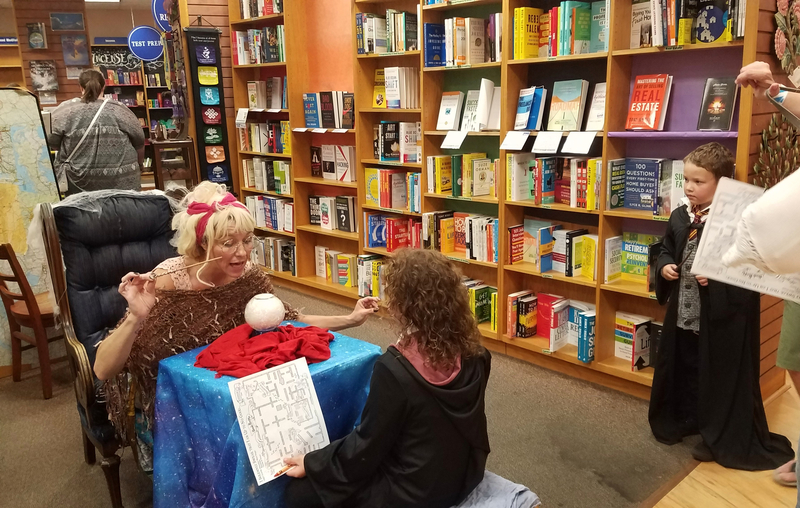 Outfitting staff actors in her own collection of wigs and costumes, she (and her many eager collaborators) really brought the spirit of the wizarding world to life. And I loved seeing some of our newer staff members get to be a part of it all. From M.K. 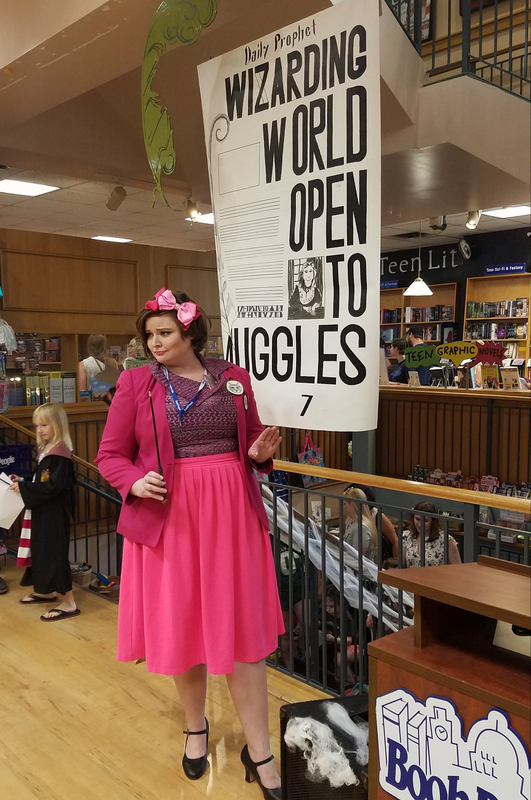 who circled the store performing dramatic scenes as Mrs. Weasley, to Walden who transformed into a simperingly odious Umbridge, to Griffin who not only painted many of the signs for the party, but helped wands choose the right wizards all night long. It was a treat to see them experience the fun of putting on this show for the very first time. Here are some highlights I documented over the course of night (just with my phone mostly). Tell me, what did you all do? 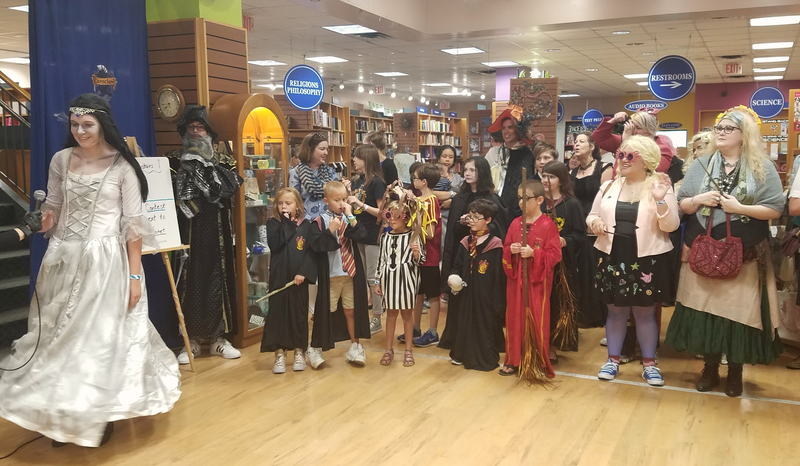 Thanks to all of the witches and wizards who joined us tonight to celebrate the 20th anniversary of the Harry Potter books on Harry’s birthday! This entry was posted in Uncategorized on August 3, 2018 by Meghan Dietsche Goel.